Objectives Pain is a very common symptom of juvenile idiopathic arthritis (JIA). Disease activity alone cannot explain symptoms of pain in all children, suggesting other factors may be relevant. The objectives of this study were to describe the different patterns of pain experienced over time in children with JIA and to identify predictors of which children are likely to experience ongoing pain. Methods This study used longitudinal-data from patients (aged 1–16 years) with new-onset JIA. Baseline and up to 5-year follow-up pain data from the Childhood Arthritis Prospective Study (CAPS) were used. A two-step approach was adopted. First, pain trajectories were modelled using a discrete mixture model. Second, multinomial logistic regression was used to determine the association between variables and trajectories. Results Data from 851 individuals were included (4 years, median follow-up). A three-group trajectory model was identified: consistently low pain (n=453), improved pain (n=254) and consistently high pain (n=144). Children with improved pain or consistently high pain differed on average at baseline from consistently low pain. Older age at onset, poor function/disability and longer disease duration at baseline were associated with consistently high pain compared with consistently low pain. Early increases in pain and poor function/disability were also associated with consistently high pain compared with consistently low pain. Conclusions This study has identified routinely collected clinical factors, which may indicate those individuals with JIA at risk of poor pain outcomes earlier in disease. Identifying those at highest risk of poor pain outcomes at disease onset may enable targeted pain management strategies to be implemented early in disease thus reducing the risk of poor pain outcomes. Juvenile idiopathic arthritis (JIA) is the most common form of inflammatory arthritis in children and young people. Pain is one of the most common symptoms reported by children and young people with JIA. Pain in JIA is poorly understood and unsatisfactorily managed for children and young people. Children with JIA classify into three pain groups: consistently low pain, improved pain and consistently high pain. A clinically significant proportion of patients experience high pain that persists. Factors at presentation including age at onset, disease duration, functional disability and pain are identified as associated with consistently high pain over time. This study will help identify children at the highest risk of chronic pain, who should be targeted early with multidisciplinary pain management interventions. Pain is a commonly reported symptom in JIA7 8 and a recent study of illness perceptions in adolescents with JIA found that beliefs about their disease activity was influenced by their experience of pain.9 A study of individuals with polyarticular JIA found that pain was reported almost daily, with 31% reporting severe pain.10 Such levels of pain interfere with physical, educational, emotional and social activity, even when disease activity is controlled.11 12 Moreover, a significant number of patients continue to report pain into adulthood.13 This may explain the emerging consensus that the management of JIA needs to address more than active inflammation14 to minimise the long-term impact of the disease. The participants in this study were recruited to the Childhood Arthritis Prospective Study (CAPS). This longitudinal prospective inception cohort study of individuals with new-onset inflammatory arthritis, primarily JIA, was established in 2001, in the UK. Methodological details of this study have been published elsewhere.22 Patients are recruited into CAPS at first presentation to paediatric rheumatology (baseline). Written informed consent was provided by parent(s)/guardian(s) and patients (aged 16 years and older) in accordance with the Declaration of Helsinki. Data items used in the present analysis included the 10 cm pain visual analogue scale (VAS) (580 proxy reports and 271 child reports), active joint count (AJC) from 71 joints, 10 cm physician’s global assessment (PGA) VAS, 10 cm patient/proxy general evaluation (PGE) VAS, Child Health Assessment Questionnaire (CHAQ: functional disability) scored 0–3, Moods and Feelings Questionnaire (MFQ) scored 0–66 (self-report) and 0–68 (proxy-report) and the physician-assigned International League Against Rheumatism (ILAR) subtype. In addition, this analysis also included medication taken in the first year (eg, disease-modifying antirheumatic drugs (DMARDs), biologics and steroids). Data included in the analysis were collected at baseline (presentation), 6 months, 1 year and then annually up to 5 years. The data were extracted from hospital records and questionnaires. The primary outcome measure was the 10 cm pain VAS scores. Only children with a JIA subtype recorded at year 1 and pain scores recorded at baseline plus at least one additional follow-up pain score (up to 5 years postbaseline) were included in the analysis. A two-stage approach to this analysis was used.23 First, pain trajectories of patients were modelled using a form of discrete mixture-modelling called group-based trajectory analysis (GBTA).24 GBTA assigns each individual to a trajectory group, based on Bayesian posterior probabilities for group membership.21 Group-based trajectories were modelled in groups ranging from two to six trajectories. The optimal number of possible trajectories was determined by statistical fit (including Bayesian information criterion and model parsimony21) and the clinical relevance determined by the research team. In total, 851 patients were included in this analysis. The median age at diagnosis was 7.6 years (IQR 3.6, 11.8), the median age at disease onset was 6.6 years (IQR 2.7, 10.8) and median disease duration at presentation was 5.3 months (IQR 2.7, 10.7) (table 1); 66% were female. The most common ILAR subtype recorded at 1 year was persistent oligoarthritis (n=265, 42.7%) (table 2). There were negligible differences in characteristics between those who were included and excluded from this analysis (see online supplementary table 1). The three-group model of pain (figure 1) was selected as the most clinically and statistically satisfactory (see online supplementary table 2). Over 78% of children had a >0.7 probability of membership in their assigned trajectory groups. The averaged posterior probabilities of group membership for each of the subgroups were all high (>0.8) with the smallest trajectory group representing 17% of the study population. 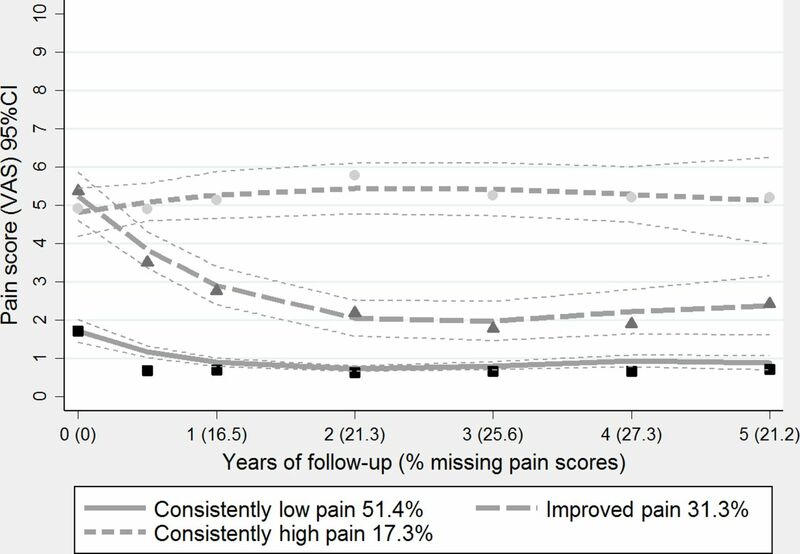 Pain trajectories from baseline to 5-year follow-up. VAS, visual analogue scale. The largest group in the three-trajectory model was ‘consistently low’ pain, which accounted for half of the participants in this analysis (figure 1). This consisted of a horizontal trajectory undulating around the 1 cm point of the pain VAS (starting at 1.8 cm) throughout the 5-year period. The second group was ‘improved pain’, which accounted for almost a third of participants. This trajectory (starting at 5.5 cm) illustrated dramatic improvement in pain in the first year of follow-up, leading to a plateau for the subsequent 4 years. The third trajectory (starting at 4.9 cm) was ‘consistently high’ pain, which again was broadly horizontal, oscillating around the 5 cm point of the pain VAS throughout the 5-year follow-up. Subgroup analysis illustrated clear differences on average (median) between low persistent pain and the other pain trajectories across the majority of covariates (table 1). On average (median), older age at onset, older age at baseline, baseline pain, longer disease duration at baseline and early changes in PGE, pain and CHAQ, distinguished between trajectories with consistently high pain and improved pain (table 1). Overall, 17% of the study cohort was in the consistently high pain group, this increased to approximately 25% for extended oligoarthritis (n=8, 24.2%), polyarthritis RF+ (n=6, 26.1%) and psoriatic arthritis (n=14, 26.9%) patients, and over 30% for children with enthesitis-related arthritis (n=10, 30.3%). While 42.7% of the study cohorts were classified with persistent oligoarthritis, this increased to over half of the children in the consistently low pain group and down to approximately one-third of the children in each of the other two groups. Variables associated with improved pain when compared with consistently low pain included being female, and longer disease duration, higher PGE and higher pain at baseline (table 3). In addition, associated early change factors included increased PGE in first 6 months, and increased CHAQ and pain in the first year (table 3). When comparing consistently high pain with consistently low pain, baseline factors of older age at onset, longer disease duration, higher PGE, higher CHAQ and higher pain were associated with consistently high pain membership, along with early change factors including treatment with biologics in the first year, increased PGE in the first 6 months and increased CHAQ and pain in the first year (table 3). Finally, when comparing consistently high pain with improved pain, the baseline factors of older age at onset and higher CHAQ were associated with consistently high pain, along with the early change factors of increased PGE in the first 6 months, and increased CHAQ and pain in the first year (table 3). A notable finding was that baseline measures of disease activity such as the AJC and PGA, did not predict children’s membership in any pain trajectory group. In contrast, baseline evaluations of patients or proxy (CHAQ, PGE and pain) scores did inform membership in the pain trajectories, as did early changes in those measures. Baseline functional disability (CHAQ) was a strong predictor of membership of the consistently high pain trajectory. Packham and Hall in their cross-sectional study found that functional disability contributed 18% of total variance explained in pain.4 Interestingly, an analysis of the CAPS cohort after a 1-year prospective follow-up found baseline pain to be a predictor of moderate-to-severe functional disability.32 These findings demonstrate the complex relationships between pain and functional disability, with experiences of one likely to contribute to the self-report of the other. Disease duration at baseline was also associated with consistently high pain. One explanation for this may be due to the greater potential damage caused by JIA prior to its remission in consistently high pain owing to potential delays in appropriate treatment22 (with 21% of patients in this study waiting ≥1 year prior to presentation). Fantini et al found attaining remission decreases in proportion to delay in presenting to paediatric rheumatology.3 Oen et al found that time between onset and diagnosis was a prospective predictor of functional disability at follow-up.5 Parent’s unfamiliarity with the urgency of symptoms may delay seeking medical advice22; complicated by variables such as socioeconomic status.36 Therefore, their disease may go untreated for longer allowing functional disability to increase,22 potentially demonstrating why poor functional disability predicted consistently high pain. This may also lead to a greater probability of enhanced sensitivity to all pain-inducing stimuli beyond that induced by affected joints.7 This amplification in pain may persist beyond the resolution of inflammation leading to peripheral and central sensitisation,7 and lowered pain thresholds, pain tolerances37 and high chronic pain, as found in those in consistently high pain. Contrary to previous research, depression was not found to predict any pain trajectory.28 38 In this study, depression was correlated positively with pain (see online supplementary table 4). An explanation for the findings may be that PGE, which is a measure of well-being, occupies similar variance associated with depression, thereby reducing its uniquely associated contribution. Higher PGE scores were found to predict consistently high pain. Patients and/or their parents more readily view pain as an indicator of arthritis9 39 than do clinicians. Therefore, PGE scores would provide a more accurate indicator of pain experiences over time than PGA, as it takes into account pain experience. The findings from this study have a number of implications for pain management in children presenting for the first time to paediatric rheumatology. Alongside objective markers of disease activity, this study suggests that clinicians should ensure that pain is also addressed, particularly among those presenting with higher levels of pain and PGE, poor functional ability, older onset and/or longer disease duration. Importantly, early increases in PGE, poor functional ability and pain are also independently associated with consistently high pain, indicating that delays in pain management may only serve to increase the risk of a child developing consistently high pain. Hence, pain management should be prioritised early in children with JIA. Furthermore, medications such as DMARDs, biologics and steroids, which are used to reduce disease activity, may be less efficacious in reducing pain in some patients. Therefore, an integrated management approach in which pain is assessed and managed alongside disease activity is needed to reduce the prospect of poor long-term pain outcomes. These findings must be viewed in the context of some limitations. The pain, PGE, CHAQ and MFQ score was reported by a parent for children under the age of 11 and were self-reported by children aged ≥11 years. The potential limitations of such strategies of data collection have been identified previously.40 However, this strategy reflects the routine collection of data in the UK paediatric rheumatology. Therefore, the baseline covariates in this study correspond with data that were available to paediatric rheumatologists. Furthermore, information on pain management was not examined, which may highlight that if interventions were used they were not adequate in reducing pain in at least a fifth of the cohort. This study has used clinical data which are routinely collected from patients with JIA to classify pain trajectories into three categories. Factors which contributed to pain patterns included disease features (eg, duration, age at onset, etc), which would enable children with JIA at an increased risk of consistently high pain over time to be identified early in disease. It is important for children with JIA that integrated pain management strategies are used in addition to pharmacological therapy aimed to control inflammation, and targeted at those most at risk, as soon as possible after diagnosis to improve important long-term pain outcomes. The authors would also like to thank all local research coordinators and principal investigators who have made this research possible as well as members of the research team at University of Manchester. The members who contributed were as follows: Alder Hey Children’s Hospital: E Baildam, C Lydon; Great Ormond Street Hospital: L Wedderburn, C Johnson; Royal Hospital for Sick Children (NHS Lothian): J Davidson, J Baggott; Royal Hospital for Children (Glasgow): J Davidson, R Boyle; Royal Manchester Children’s Hospital: A Chieng, A McGovern, A Duggan; Royal Victoria Hospital (Newcastle): F McErlane, K Devine, S Crulley; University College London Hospital: Y Ioannou, L Suffield and the research team at the University of Manchester: W Thomson, KL Hyrich, R Carrasco, P Gilbert, A Smith. The authors would also like to thank Dr Bo Fu for his statistical advice. In the end, the authors would like to thank all of the patients and their families who contributed to the Childhood Arthritis Prospective Study.
. Remission in juvenile chronic arthritis: a cohort study of 683 consecutive cases with a mean 10 year followup. J Rheumatol 2003;30:579–84.
. Development and preliminary validation of the pain perceptions questionnaire for young people with juvenile arthritis, 2016.
. Group-based trajectory modeling an overview. In: Piquero AR , Weisburd D , eds. Handbook of quantitative criminology. New York, 2010:53–67. doi.
. The child’s perception of the disease and the experience of pain in juvenile chronic arthritis. J Rheumatol 1983;10:61–5. Contributors AR, RC, LC, SMMV, KLH and WT were responsible for data cleaning and data analysis. HEF, EB, AC, JED, LRW, YI and FM were responsible for data collection and contribution to the final analysis. Funding The ‘Childhood Arthritis Prospective Study (CAPS)’ is supported by the Arthritis Research UK Special Strategic (grant number 20542); Arthritis Research UK Centre for Epidemiology (grant number 20380 to AR, LC, RC, SMMV, KLH and WT); National Institute for Health Research Manchester Musculoskeletal Biomedical Research Unit to AR, SMMV, KLH and WT; Arthritis Research UK Centre for Genetics and Genomics (grant number 20385 to WT); National Institute for Health Research University College London Hospitals Biomedical Research Centre to YI and LRW and Arthritis Research UK (grant number 20164 to YI and LRW). LW is supported by Arthritis Research UK Grant 20164, and the NIHR Great Ormond Street Hospital Biomedical Research Centre. This work is also supported by the National Institute for Health Research Biomedical Research Centre Funding Scheme and is adopted into the NIHR Clinical Research Network Portfolio (CRN Study ID: 2635). Competing interests KLH has received honoraria from Pfizer and AbbVie for work unrelated to the present article. Ethics approval The study was approved by the North West Multicentre Research Ethics Committee and all participants gave written informed consent.